I turned on the news this morning and found out that Spring is about to officially begin! But rather than jump into the spring recipes, I’m going to help you savor these last couple days of winter by providing the the ultimate comforting soup recipe: a thick and hearty potato leek soup. Over the years, I have made and shared this particular recipe more than any other. So, of course, friends and family have been asking why I’ve never posted it on Pinch My Salt. That’s a very good question. The answer is simple: this is my mom’s soup. What does that mean? Well, it’s just hard to write about a recipe that is so intertwined with memories of the person who meant the most to me and who isn’t here to make it anymore. I can make the soup, eat the soup, share the soup, but just haven’t quite been able to write about it without the waterworks starting up. 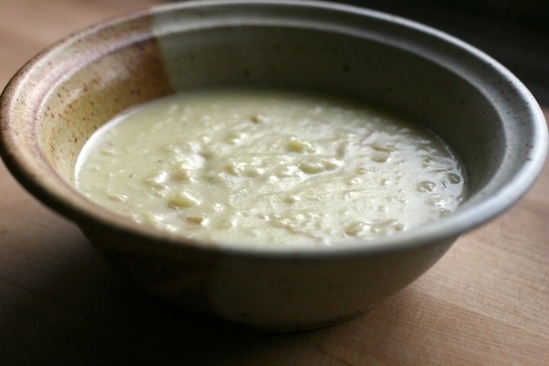 But hearty soup season is almost over so I got out the box of tissue, pulled out the 15-year-old recipe card, and I’m here to share the easy but wonderful potato leek soup recipe that has the power to transport me back to my childhood with just one bite. Notes: *Make sure to clean leeks thoroughly and slice only the white and light green part of the leeks. 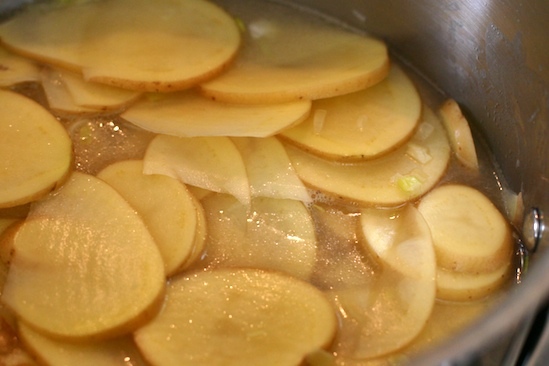 **You don’t need to peel the potatoes as the peels add to the rustic texture of the soup. But make sure to scrub them thoroughly and remove any obvious blemishes before slicing. Although we always make it with chicken broth, this can easily become a vegetarian soup by simply using vegetable broth instead. And here’s a quick photo tutorial to show you how easy it is to make! First of all, I’ll let you in on a little secret. For years I always sliced my potatoes by hand until I realized that my new food processor has a large enough feed tube to fit one or two whole potatoes at a time! Now I always slice my potatoes in my Cuisinart food processor using the slicing blade. If you have one that will work, great! If not, just slice them by hand using a sharp knife to about 1/4 inch thick. It really doesn’t take as long as you think! 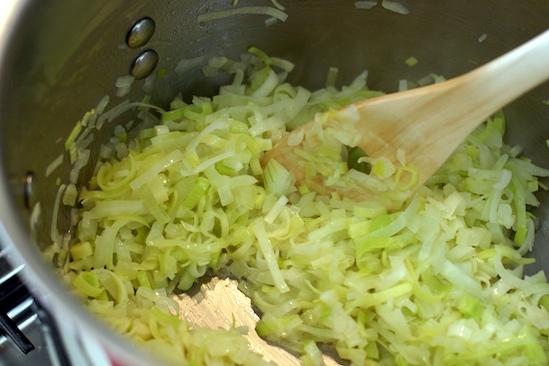 Start the soup by sauteeing the leeks and onions in butter until they are limp and just starting to brown. Next, add all of the potatoes that you worked so hard to slice (unless you’re a cheater like me). After adding potatoes, pour in enough chicken broth to just barely cover them. The amount you use depends on the size and amount of potatoes you sliced. Two 14 oz. cans of broth is average but use more if you need it. As you can see the level of liquid is just even with the potatoes. If I push down on the potatoes with the masher, they will be completely submerged. This amount of liquid results in a very thick soup. The soup can always be thinned at the end with some extra broth if desired. It doesn’t take long for the potatoes to cook and you can probably start mashing within 10 minutes or so. The amount of mashing you do is entirely up to you. If you like chunkier soups, leave the potatoes a bit chunky. If you want a smooth soup, mash for a longer time. 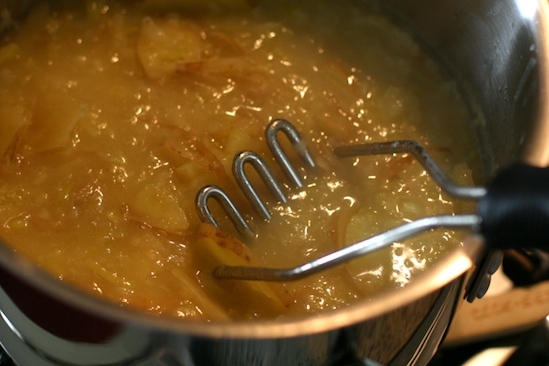 If you prefer a completely smooth soup, peel the potatoes before slicing and puree soup with a hand blender. I’ve never done this but I’m sure it would work. When the soup has reached your desired consistency, add some heavy cream. The original recipe says 1 – 2 cup of cream but I never use more than one cup. I think you lose a lot of flavor by adding more cream. But, again, it’s up to you. Make sure to season well with salt and pepper after stirring in the cream. This is what my soup looks like when it’s ready to eat. As you can see, I like a slightly chunky consistency but no large pieces of potato. I made a very similar recipe the other day to eat along with our corned beef (leftover) rueben sandwiches. No a single serving was left, which made me so sad because I was banking on it as a my lunch the next day. It's so nice when simple ingredients and a simple recipe yield amazing results. ooh, i do love potato leek soup! my mom made a batch every sunday during the winter months and it totally makes me feel like a kid. time to get back that feeling, i think! Thanks for sharing this recipe and for the beautiful memory of your childhood and your mother. that soup looks so simple, but so comforting and delicious, yum. and lovely post in general - thanks for sharing it. Those look much more like yukon gold potatoes than russets. Because yukon gold have a more potato-y flavor, they'd be nicer in the soup than russets, anyway, so I'm not complaining. If I were using russets, I'd certainly want to peel them. Peter: Yes, those were some nice looking leeks!Kat: What a great idea! I actually haven't made this in a while. These photos were taken a while back. We have some leftover corned beef in the fridge because I didn't make it til the day after St. Paddy's day. Maybe I should whip up some potato soup to eat with leftovers tonight! :-)Kickpleat: Wow, once a week! We didn't have it quite that often but it brings back memories just the same. :-)Joy: Thanks!Michelle: That's the great thing about almost all potato soups...simple to make but very satisfying and delicious!Johan: You're right, those aren't russets in the photos. These photos were taken while I still lived in Italy and my Italian potatoes were somewhat similar to yukon golds. But we generally just use russets for this soup, because those were the kind of potatoes we grew up eating. I happen to like the skins but like I mentioned earlier, it's all a matter of taste :-) Yukon Golds or any other type of potato would certainly be fine for this! This is one of my favorite soups. I don't usually add the cream -- it's a luxury item in our house -- but I do puree with an immersion blender. I think Corinne made that for me once, although I don't know if it was your mom's recipe. Ruby: I assumed you had the recipe, I think Steph does. You've really never made it? As for the ham in the soup...she never made it like that for me and I've never done it myself although I've been tempted to try it. What I'd really like to make is a baked potato soup with bacon, cheese, chives, etc. I'm making myself hungry now! mmmmmmm....mmmm..good! I LOVE this soup! I know it is one of those foods that triggers wonderful memories of K, and at the same time makes you miss her even more! I have to say I think this is one of the first recipes I ever made! I love it! It really does take me back to the good ol' days. I've been looking for a really good potato leek soup, looks like I may have found it! With the weather still being a bit on the cool side, I will have to make this soon! Thanks so much for sharing this precious recipe of your Mum's. I can see why it such a special recipe. I've never made it with so little stock before, and mine always seems a little too watery so I think your point about the relatively small amount of stock is spot on. I will try it your way now! Nicole, this soup looks so delicous. I love hearty soups! It is so sweet you are posting you mom's recipe. May she rest in peace. My husband doesn't like leeks (the only thing he just can't eat) but I do love them and will make this soup when he is not around:)) You have a beautiful blog, nice writing, nice pictures! I will be back soon! Corinne: Did you notice Jason's comment earlier? :-)PatsyK: Hope you get a chance to try it soon!Nancy: This definitely makes a very thick soup! I hope you enjoy this version :-)Katy: I never eat leeks by themselves since I'm not a huge fan of anything related to onions but I've heard that braised leeks are actually very good. Maybe I should give them a try.Farida: I actually don't eat leeks much either except for in this soup! Maybe your husband wouldn't notice if he didn't see you make it :-)Christy: Bacon would be really good in this! Thank you for sharing. What a wonderful, multi-sensory, memory of your mom. I'll think of you both when I give it a try! What a delicious looking hearty soup! I have a similar version too. Isn't it amazing how simple veggies like potatoes and leeks can produce a soup as lip-smacking as this one! Wow, you really made this soup look inviting, comforting and delicious! Love the play by play pictorial too. Mmmmmm, I like the idea of savoring the last of winter instead of jumping into spring. I love the simplicity of this soup:). looks delicious nicole! the only thing i would do differently with this recipe is add some bacon! mmmm bacon goes great with a creamy potato soup! The last days of winter...? Hmm...sure doesn't seem like it around here! I'm excited to make this soup. I'm glad you braved the recipe (box of tissues on hand) to share it with us. It's so tough but so good to have something like this soup that is such an integral part of the many memories. 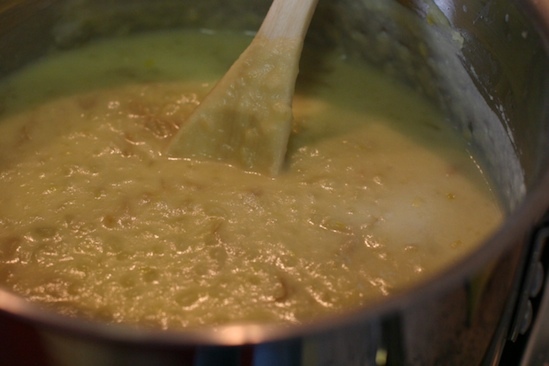 A cup of heavy cream and 3Tbs of butter are completely extraneous for this recipe if you just use a stick blender to process the soup...a Tbs of each should suffice. Beautiful photos and the soup looks delectable! Hi, I'm trying this recipe out right now! Thanks for posting...I found this one to be the most simple and interesting of the leek/potato recipes out there! Will let you know how it turns out! That looks delicious! When can I come over? Lordy mama looks so yummy. Great recipe. Can't wait to try it. Now that winter has finally arrived here in Denmark at the end of MARCH!!!! Hey Nicole!Beautiful soup! I'll have to try the recipe since we have leeks from, you guessed it, the CSA. Leeks always make me think soup and I was looking for a recipe to use them in. I'll let you know how it looks.Waterworks or not, this is a beautiful tribute to your mother. I think she'd be proud. What great play by play photos. It's officially spring but lots of time for hearty winter soups left. 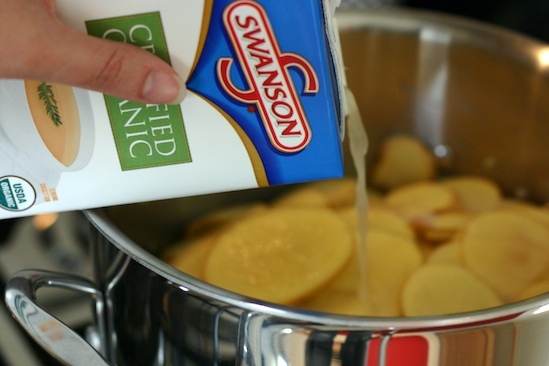 Watch out for the chicken broth, because prepared broths like Swanson's have oxidized, and have an unpleasant metallic flavor that comes through in the soup. The recipe I have is from Shirley King's book "Pampille's Table," a translation and adaptation of Marthe Daudet's 1919 classic "Les Bons Plats de France." 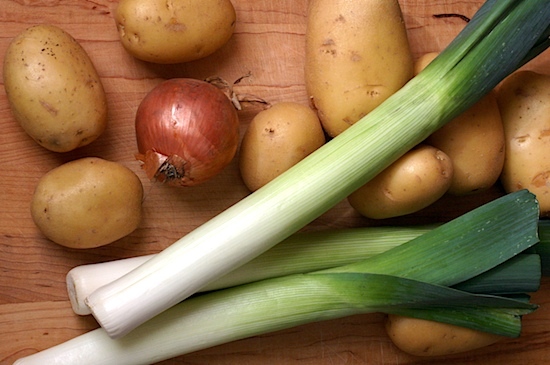 This authentic French recipe uses 2 quarts of cold water (also good for veggie soup-eaters), one bunch of leeks, 4 medium potatoes, salt and pepper. You use 4 tablespoons of crème fraîche and two tablespoons of butter to thicken it--which might be less fat than the cup of whipping cream--and put a slice of stale baguette in the bottom of the bowl before ladling soup over it. Great for parties! Oh my god, I have to make this. Right now. Well, soon.Thank you for posting this recipe. It looks and sounds so heavenly. You have a nice looking blog! This is my first time here - I came from HealthCastle and saw that you've won their top blog awards! Congratulations! Excellent job (as usual) on this recipe! I think the number one thing I enjoy about the winter season is the opportunity to make wonderful soups such as this. This be the real soul food, eh? I could eat potato soup any time of the year!I like to make soup at least once a week to have with dinner because it's filling, SO yummy and so good for you (veggie varieties anyway). Anytime is a good time for soup in my book. I used to make it more when I lived in Portland because it was cold. Now in southern Cali, I really do have to remind myself to make it. This soup is just one of those things that seems like love in a bowl, so it doesnt surprise me that it is a food that brings back strong memories for you. My husband feels the same way about potato leek soup. For me it was always the memory of my mom getting up early on really cold midwestern winter mornings to make us old fashioned oatmeal with brown sugar and raisins. To this day it brings back memories of childhood in one bite. Thanks for the recipe and great photos! Winter is lingering here in Iowa, so it is very appropriate and appreciated! This soup looks amazing. I'm very impressed with your ability to write about a recipe that means so much to you. I can understand why this would be difficult - food is so tied to our lives, and our memories, and when you make a favorite dish it can be like bringing the person back, sitting with them while you cook and eat. And to write it down.... it's giving a finite quality to something that feels so infinte. Bravo for that, possibly more than for the recipe. (Although let's face this, I'm probably going to unceremoniously gank this recipe and use it mercilessly).Cheers. Come on Winter! This sound so good that I think I'll have to make it in summer... YUM! I love potato leek soup -- Never made it myself before, but I've been craving it. This was the easiest recipe I came across. IT TURNED OUT GREAT. Thanks for sharing. I just moved to the east coast and fall is in the air and this is the perfect soup to commemorate it. It was very easy to make and the food processor proved to be a great tip! Thank you for sharing. Marie: The whole stalk is considered to be one leek. But the dark green 'leaves' at the top generally get cut off and discarded. For most recipes (including this one), you just use the white and maybe some of the light green part on the bottom. Hope this helps! thanks, let you know how it comes out. I was looking for a recipe to cook for my wife on Wednesday as she finally got a job and demanded I cook for her one time after 10 years! And thought, how about a tuna caserole. Something different and something I can't goof up. I ate them at friends houses when I was a kid during the 80's Thats how i came upon your blog! Now I also stummbled upon this potato/leek soup which I love but it looks a winner as well. Wish me luck! Hi Nicole.Your recipe looks great but I just wanted to say thanks for the photos and layout etc.. it looks beautiful! WOW! Mine is simmering as we speak... I followed this recipe step by step and have never made a better potato leek soup. IMHO, the flavor is even better than the PL soups by by Jamie Oliver and Emeril! I admit I had to add BACON (I add bacon to everything but chocolate cake - LOL). I added 10 slices of pre-cooked cut bacon during the simmer stage. Question: Is there a flavor benefit to slicing the potatoes rather than dicing them, it seemed more mashing was required in the pot? Thanks to you (and your mom) for a wonderful comfort-food recipe. I just wanted to let you know that I found this recipe through StumbleUpon a few weeks ago and bookmarked it for when cold weather hit. It's not terribly cold here, but I woke up this morning *with* a cold, so I decided it was time to make the soup. I'm finishing my first bowl now, and it's so amazingly good! I feel like someone who loves me made me soup (the point of the entry, I'm quite sure), and it goes a long way to easing the illness.Thanks so much for sharing what is clearly a very personal recipe. It will brighten a lot of winter tables, judging by the comments here! My daughter wasn't feeling good and she desired potatoe and leek soup and this is just what I was looking for.Thanks!!!!!!!!!!! I googled "winter soups" and came across this recipe. I can't wait to make it. Thank you for sharing this wonderful recipe and your wonderful story of your mother. I, too, can eat certain foods and they take me down memory lane. Connie: I hope you enjoy it! Thanks for such a lovely recipe and history. I think that all food is intimately tied to our memories and our personal stories. I've been looking for a recipe for potato leek soup (because I have an abundance of both) and I'll use this one because of the story you relayed. It makes it feel more meaningful even to me as a stranger. Thank you for sharing. Of all the recipes out there - this is the one I am going to try - your narrative speaks to me - and food is so much a part of my life - a recipe with a history is the best kind of all. Thanks. This is virtually identical to the recipe that I like to make, but there is one significant difference. Instead of using butter to cook the leeks and onions, I take 3 strips of bacon, chop them into small pieces, and cook until there is enough fat rendered for cooking the leeks and onions. The small pieces of bacon, and the taste of bacon fat throughout the soup add a wonderful taste. I just finished making the recipe and it is DELICIOUS!!! I didn't read the section in the recipe where you say to use only the white and light green part of the leek. I used the whole thing!!!! It still came out great!!! Thanks for a great recipe for a rainy fall day!! BTW - I used Yukon Gold potatoes and Red Potatoes....DELICIOUS!!!! Thanks everyone for letting me know that you've tried the recipe! I read every comment and e-mail and it means so much when you take the time to share your experiences with me! OMG, I'm now famous for this recipe...I make it for family, coworkers, friends. I took some on sick visits to hospitals, they all felt so loved and I know it's due to this great recipe. Thanks soooo much for sharing and putting pen to paper. The sliced potatoes are GENIUS!!! I wish I could have thought of it on my own. They break down very well, and depending on my mood of "to peel or not to peel"....either way works, elegant or rustic. I sometimes add shallots/bacon/ cheese, whatever I have on hand. I like the earlier comment to add stale baguette, so will try it next. I just made this soup for the first time for my boyfriend. Thank you for the clear, concise directions - they were easy to follow and the soup was delicious. Thanks for posting. I am making this for Thanksgiving. I might add some velveta cheese to the disch as well. Very good-the whole family enjoyed it. Thank goodness for food processors! Delicious! Made some today and we enjoyed it - definitely a hit for a cold winter day. Thanks for sharing and the pics are wonderful! Thank you for sharing...your story as well as your recipe. I made this soup while thinking of happy times spent with my mom rather than focussing on how much I missed her. The time spend making this delicious soup was enjoyable...all because of a shift in thinking. I thank you for that. My daughter had some leeks and didn't know what to do with them. I told her there were soup recipes and if she left them with me I would find a recipe and make some soup.I never made potato leek soup before. I went to the internet to get a recipe and there a too many. However, it was your shared story about your mother that made me want to try this one. There is nothing like mother love in food. The recipe was simple and the results great. Thank you for sharing. This looks perfect for my left over mashed potatoes! Just wondering if I use the green tops to the leeks? I've never cooked with them before. Thanks! I made this yesterday.1. Absolutely fantastic 2. 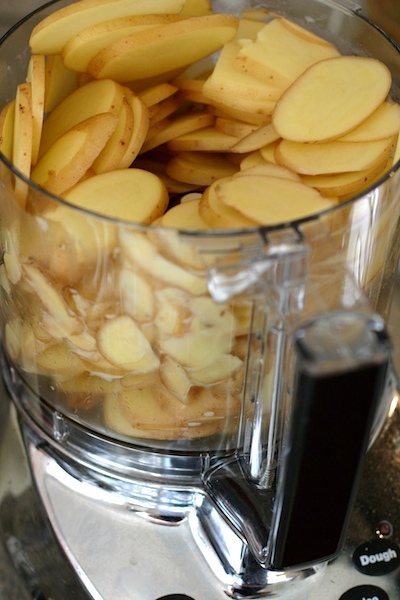 Great tip using the Cuisinart/food processor to slice potatoes, leeks, onions. 3. I added some chopped bacon to the butter and cooked it about 5 minutes before sauteing the leeks and onions...IMHO, the bacon is a crucial ingredient.This may have been one of the best soups I have ever made. Thank You. I made this soup for my family tonight, and I have to say it's one of the best soups I've made. What really sealed the deal was the ease of preparation--it took 30-40 minutes to make a hearty soup that everyone really loved.What do you usually serve this with, if you don't mind me asking? I just served with crispy baked rolls, but I definitely want to work this into Christmas dinner. Mike: Thanks for your comment! I'm sure the bacon adds a wonderful flavor to the soup, and I do love other potato soups with bacon. But I always make this one without anything extra since it's my mom's soup and I've been eating it this way since I was young! But I definitely encourage everyone to make this soup their own by making delicious changes like you suggested!MW: We usually eat the soup with nothing more than some homemade bread and maybe a side salad. So glad to hear that you and your family loved it! I just made this soup for my sick-with-a-cold roomate and I after searching for some hearty soup recipes. Needless to say it was wonderful, although I felt it needed a little something (just as the people with the bacon tip) and added some dried dill. My roomate said the dill was the key, and I definetly agree. I served the meal with some warm grainy rolls and butter. A lovely home recipe to keep cozy. Thanks! I found this recipe through google a month or so ago (after harvesting my first crop of leeks from the garden & trying to figure out what to do with them) and have made it at least once a week since then. It's the best potato leek soup I've ever had!!! Thank you so much for sharing! I loved the 8x10 glossy photos. I am going to make this soup for my family. I may take someones suggestion on the Yukon Gold potatoes. She said they have more of a potato taste for the soup. I will use the 1/2 and 1/2 instead of heavy cream because we always have that in the refridgerator. 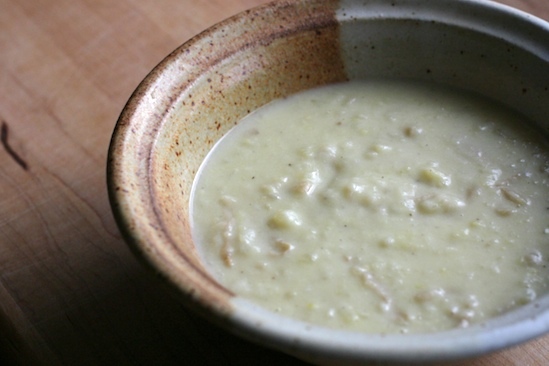 I don't believe I have ever had leeks and my daughter will love fresh, hot potato soup. I liked the story that the family dog didn't eat peas. I thought that was a dog after a kids heart. My dog loves everything, from tomato soup to Jello. I made this soup last night and it was delicious. We only used a 1/2 cup of cream, but the results were still fantastic. Your blog is now one of my favorites! Thanks for this delicious recipe! I made it last night for some friends who were over for dinner, and they loved it! One guy said that he usually hates leeks but that this soup really won him over, thanks! I've bookmarked your blog and will definitely keep up with it from now on! Thanks for sharing this recipe. I was looking for a simple yet tasty way to make this and your recipe is simply the best I've tried. My family raved over it and I had very little left even after doubling the recipe. I just love hearing from all of you who have tried the soup! I'm making this tonight for an early, informal Christmas gathering with my sister and brother-in-law. Can't wait to eat some! I made this soup for my family -NON-SOUP LOVERS and it was an absolute HIT!! I used Yukon Golds though and it made it very rich and comforting THank you!! Thank you for the great recipe! I tried it and it came so... delicious!!!!! Thanks for posting this recipe. I came across it while looking for a potato leek recipe that reminded me of my own mom's recipe. It's on the stove now and smells great. Mmmm, good soup! Very homely and comforting. I was looking for a good potato and leek soup recipe, and decided on yours because I loved the way you shared the story about your mom... very moving, and much more appealing than just a soulless list of ingredients and steps like most recipes! My attempt came out a bit thinner than I would have liked - maybe you have smaller measuring cups in the US than we have here in Australia?? - but it'll be well worth another attempt soon! Thank you for sharing this. i am making this now. i added bacon. i rendered down some thick slab bacon and then added onions and leeks and omitted the butter. i am excited to try it! Made this soup yesterday, and as I said I would, I'm reporting back. The only changes I can think of making is I maybe used 1/2 cup of cream rather than a whole one, and I used yukon gold potatoes (they were on sale, so they win.) The boyfriend loved it too!Thanks again for such a yummy recipe! I'll definitly be making this at least once a winter! KD: Thanks for reporting back! Yes, the cream can definitely be adjusted to suit your own taste. I've had friends that have even made it with milk rather than cream (I still think it's best with at least a touch of cream). Can you believe the original recipe says you can use up to 2 cups of cream!? Also, yukon golds do work well and I sometimes use them too. It was very good, but I added a couple of pinches of dried thyme... aaach! perfect! I'll be making this, this PM. My mother always used Russets as the flesh was whiter and not as mealy as yukon golds. Also; she used butter and veggie broth (which she made) for flavor and not too much cream.As for the leeks; clean em, clean em, clean em. Just found your site. Just made this soup. Didn't have heavy cream but I had carnation milk and some Lactaid (mixed 50/50). Turned out soooo good and creamy. Definitely a new favorite. Thanks for the pics and making it so simple to prepare! Made this today and my family loved it. Delicious and simple to make. I doubled the recipe so we will be enjoying leftovers tomorrow. Thanks! Making it for the second time tonight. Love it! Never made it before but I belong to an organic co-op and didn't know what to do with the leeks I got and found your recipe. Thanks so much for sharing!!!!! Wanted to add that the first time, my husband made it! I was busy, I had chopped all ingredients but left him with your detailed recipe and he made it. It was great. Hope it is as good tonight. That is absolutely the most delicious potato soup I've ever tasted. My daughter made it a few days ago and everyone at the table was oohing and aahing as they ate it. She passed the recipe along to me, and that's how I came to find your blog. I will definitely be back. This is so strange! I was looking for a good recipe for this soup and was shocked to see the photos, as I am 99% sure that is one of the bowls my grandmother, who is a potter, makes.If I'm right, it's lovely to see people enjoying and using them! I'm also going to make this recipe tonight, but sans chicken broth. I loved your soup recipe and the bacon ideas from your bloggers (I added chunky turkey bacon). I also substituted the cream (I'm not a fan) with 4oz of Philidelphia cream cheese. Schlurp ...The last thing is that Pacific Natural Foods now sells 4 packs of 1 cup stock packs (chicken, veg and beef). I have no association with the company. It's very useful, you don't end up with half a huge pack of stock in your fridge which I tend to throw out before I use.Keep up the good work. I love this recipe. I've never cooked leeks before I thought this was a good intro to the vegetable and the soup. Simply delicious and so easy-to-do, especially for a newbie like me. Thank you for sharing it with us. I love these simple recipes - no fuss, no fancy, no fixings - just good, tasty food. Made this tonight and absolutely loved it! Makes a lot of soup. I hear it freezes well. Also found a good video on cleaning leeks: http://video.about.com/frenchfood/Cleaning-Fresh-Leeks.htm Thank you for sharing and thank you also for your wonderful photos! I made this for a family game night at our place. I substituted low-fat half and half, added a little leftover ham to the soup and caramelized the onion and leeks a bit more than you call for. It was very easy to prepare, and the food processor made short work of the prep time.It was a big hit. I'm fortunate to have a bit leftover for lunch over the next couple of days. Thanks for sharing. Just had to say thanks for a great and simple recipe. I also added a little crumbled bacon and used fat free half and half as well. I used Yukon Gold potatoes instead of Russet. I made it as part of a Valentine's Day dinner for my wife and she loved it. My kids also enjoyed it. And the next day, it made a great lunch. A few splashes of hot sauce perks it up a bit too. I use Goya for that finishing touch. Our main course was Lobster Francaise. There was a great recipe for it at the noted website but there are 2 omissions in the listed recipe. But I saw it prepared on TV and can fill in the blanks. The website says 1/4 white wine and 1/4 butter. It should read 1/4 cup and 1/4 stick. I needed a recipe for potato leek and this one came up. Nice presentation. I made it with russets with skin on, but ended up removing 2/3 of the skins before serving, which worked well I think. The skins give a nice flavor, there were just too many, and they are easy to remove. I made it with 2 tablespoons butter and maybe 3 tablespoons bacon drippings, which was delicious. I added white pepper as well, which works well, and garnished with some chopped Italian parsley. Just some ideas. Thanks for the recipe! This is a fantastic looking recipe! I'm not following it exactly right now, as I only had one leek, so I added some onion and celery and also a small amount of chopped up carrot (no broth in house!). I also cooked in a tablespoon or two of chopped parsley and will use the rest for garnish. Nest time, I will try it almost exactly like your recipe, though. I am looking forward to making this in our family's cabin in Norway. I used Asterix potatoes, which are little red ones that hold their firm texture beautifully in soups. Soup is wonderful! Also, thank you for inspiring me to dig out my chopping blade for the cuisinart. I've had this thing for 5 years, and this is the first time I've ever used the blade. Usually, just chop and make dough. I even dug out the instructional vhs tape! Very old school. I'm a convert! How many servings will this make? We are having family over for dinner, approx. 6 poeple total. Since the feed back suggests that this is a super recipe, I'll wants some left-overs. I'm living in Azerbaijan and am always looking for recipes with ingredients that I can buy here. The soup was delicious! Thank you so much for sharing this soup and also sharing your mom with our family. Your mom has now touched and enriched our lives too - through you! Delicious! Wonderful recipe. Probably my favorite part is how you called to prepare your potatoes. Thinly sliced and later partially mashed as you showed really gives a great texture to this soup. I garnished with sour cream and dill. Thanks! Wonderful soup! It is a childhood favorite .... only difference is that Mom (and now me), cooks bacon with the leeks. Yumm! I found this by chance on the internet and made it for my family. WOW! This soup was delicious, and made the whole house smell great too. :) A perfect rainy day meal! I had made a potato leek soup a while back and it was very involved (and I ruined it with the wrong amount of rosemary- that is one touchy herb); I haven't tried the soup since. I recently started receiving a box of local organic veggies each week and am enjoying the challenge of coming up or finding new great recipes (or revisiting old ones). And when this last box had leeks, I searched for another recipe...this is GREAT!! I love the simple list of ingredients and only dirtying one pan! We've had a breakthrough! After attempting rice cereal, oatmeal, apples, pears, sweet potatoes, baked potatoes, all with no more than a solitary taste- my 7th month old son apparently has a more complicated palate...he seemed to really enjoy the Potato Leek Soup we had for dinner tonight! We all loved the soup! Thanks for sharing the recipe- it will be a standard in our home! I just love this soup hot ... but found that if I substitute the butter for oil and puree the final result - it's great to eat COLD as well! WOOHOO .. a soup I can eat all year round! Thanks so much for sharing this great recipe. I'm making this soup minus the chicken broth(vegetarian) and I'm using some fresh wild leeks from VT! I'll let you know how it turns out. Looking to reduce my physic equal to my new financial leanness, thanks to Bernie Madoff, soup recipes seem to have greatest value. I love this soup! I've never even tasted potato leek soup before, and now I'm addicted to it! (A sprinkle of real crumbled bacon on top really finished it off nicely.) Thank you for the great, detailed instructions. I found your recipe online and tried it... it is the best potato leek soup I have EVER had, let alone made. Thank you for sharing this delightful recipe! As Australian winter comes near, that soup really hits the spot! Thanks a lot! This recipe is amazing. Everyone speaks of the comfort it brings during the winter-days, but It has been raining in Denver everyday for weeks and this soup kept us all content and alive. We added a thin layer of shredded imported Swiss cheese to the top. Excellent!When a soup brings out the smiles - you know it is good. Thanks for posting it! I stumbled across this recipe while looking for a use for the leeks I received in my produce box this week. I added cooked white (northern) beans and some leftover ham to make it a complete meal (protein) and help stretch it across a few days. Used lowfat milk, since that's all I had, and added some extra butter in the beginning - excellent soup!!! My additions made it feel and taste like a fully-loaded baked potato! LOVE LEEK SOUP & WHEN I WENT ON THE WEB LOOKING FOR A GOOD RECIPE, WAS SO EXCITED TO FIND THIS ONE, AS POTATO SOUP IS ALSO A FAVORITE OF MINE. RUSHED OUT FOR ALL THE STUFF TO MAKE IT, AND ALSO ADDED SOME COOKED CRISP BAKON TO TOSS OVER IT. JUST TOO DELICIOUS . CAN'T WAIT TO GIVE SOME TO MY FAMILY & FRIENDS. THANKS SO VERY MUCH FOR SHARING THIS RECIPE. WHICH I WILL ENJOY ALL SEASONS OF THE YEAR. GOD BLESS. I saw leeks at Wal-mart and even tho I've only bought leeks like maybe once in my lifetime....I thought...I'd like some potato leek soup (also something I have only had once in my lifetime) most of the bunches only had two in them but I found a bunch with three so bargain minded that I am I grabbed it. Used one leek in a roasted vegetables dish the first night...then today I thought Okay ! Today is the day to make potato leek soup..It is the middle of summer here in Florida and I had been putting up mangoes all day (freezing) from off our mango tree and made a mango ginger salad dressing ... and It was a little overcast...It's been raining here a lot.. That's the only thing I can think of that would make me want to make soup..... but got online and googled Potato Leek Soup and I read a short quip that you had about your Mom...as Family recipes are also important to me ..I was intrigued. And I also like recipes that are simple with few ingredients, yet delicious...So I decided to make yours.. I had bought a ten pound bag of Mother Earth Fresh Russet potatoes from Sam's club..so I was in business. The only thing I didn't have on hand was the cream...but I did have half and half as I buy it at Sam's also in the quart size for our coffee.. I used 8 potatos, 2 leeks and one vidalia onion.. and 2 cups of half and half...I didn't have a potato masher so I used a whisk which worked well.. I also used my stainless steel pressure cooker to cook it in..I didn't pressure cook it ..just used it because it keeps things from burning as it has a thicker bottom...I used a glass lid to keep the steam in as the potatoes cooked.. It turned out excellent! and it was soo good I sat down and read all the reviews as I ate my bowl... I had to go get another 1/2 bowl to finish the reviews with! My husband said it tasted very good! That's high marks for him! Thank you for sharing the story and the recipe...and I will definitely give credit to "K" as this is her recipe...What does the K stand for by the way.. My Mother's name was Kathryn Joyce.. she went by Joyce but signed her name as K. Joyce.....That's why I am interested in knowing what the K stands for... Thanks again!! What a living legacy to your Mom, even from people that had never met her!!! Hello!Not only is this the sweetest soup story ever told, but this is the BEST soup recipe i've ever come across! Thank you so much for posting it! Your mother will live on in the homes of so many as i know this soup will be a treat forever in my family now!Thank you so much!SO GOOD! Thank you so much for sharing this recipe. I made it tonight and it was delicious. I will be making this soup for years to come! Thanks for the recipe. I grew leeks this year in my garden and didn't know what to make with them, found this recipe on the internet, tried it and it is delicious.I will be passing this recipe on to friends and family, thanks a lot. Thanks so much for a delicious recipe! It was a hit with my family . . . including my picky 4 and 6 year old children. We have leeks galore out in our garden this year, along with a large harvest of onions and Yukon Gold potatoes. How fun to use all these home and organically grown ingredients in one perfect soup. I did not have cream on hand, so I used milk instead with results that were still wonderful. Definitely a keeper. it was a cold and rainy day. We had lots of arrands to run after but took a break for lunch @ my sisters house and she served me this soup, she added velvetta cheese, it was so yummy!! I asked for the recipe and she gave me this web site.looks like a great site to add to my favorites. Thanks so much for this recipe! I'm a senior in college and now that i've moved off campus for my last year i didn't want to eat the same old 'pasta and college food' and decided to try a bunch of yummy recipes. Success!! this recipe totally hit the spot! including with my pretty picky no veggies period boyfriend and other male roommates ;-)! so excited to try out new recipes! will definitely look around this website! I tried this soup earlier this year and liked it, but found it a bit too thin the first time (I posted a comment back then too). Just recently I gave it another try, made sure not to overdo the stock (and used stock with lots of flavour), and added less cream (only about 100 ml, or a bit under 1/2 cup). It was PERFECT!!! I haven't been able to stop thinking about this wonderful soup since then... I'm about to make it again!! Thank you for a wonderful, simple, beautiful recipe that will definitely be one of my standards from now on! Wonderful recipe. I'm glad I found it on a day like today. COLD and beautiful. One of the first real fall days I have seen in 12 years! This is my first year back to NY after living in Ga for far too long. I have to admit, I was terrified of chopping off a finger tip with tears in my eyes after reading your memory of your mother. Bless you for sharing. I grew leeks this year with this recipe in mind. My mom used to make wonderful potato leek soup but I never got the recipe from her. So today I went out and harvested some of my leeks and made this. I do remember she used some hot curry in hers though so I added some in. The soup turned out beautifully and is even a pretty yellowish color. I think my mom would agree I did a good job. Thanks so much for sharing this recipe. This soup was easy to make and sooooo delicious!!!! My husband came back for seconds, so that was a very good sign. I followed the recipie as is but I did crumble some crispy cooked bacon on top at the end. Great soup! Loved it. Thank you. I found this recipe, and your blog, looking for a good potato leek soup recipe. This was delicious. Thank you so much for sharing. I also love your blog. Thanks for a great recipe! I added some carrots, used red potatoes instead and blended about 2/3 of it in the cuisinart before adding the cream. Love the smooth and chunky combination. Cheers! I just made this recipe and it was OUTSTANDING. Thank you so much for sharing. thank you so much for sharing the memories and the recipe. You made my night with this delicious easy to make recipe. Its absolutely heaert warming THANKS! I came across this recipe a while back, and have been making it ever since-summer, winter, spring, fall!!! My daughter loves it, and I eat it for left-overs all week. For this reason, I usually wing the portions to make a huge batch. In fact, I have just made a huge batch and took out some of the thickness, added lots of sharp cheddar and white wine, and have made a dip to bring to Thanksgiving!I do have a question however; how well does this soup freeze? Really enjoyed this soup tonight. Thank you for posting it. The pictures really helped. I took some liberty with variations, and used leftover turkey stock, and neck pieces for flavor. It worked out great! Very, Very, Very good soup. I do add celery, garlic and ham from Thanksgiving leftovers, but even without my extras this has got to be one of the best soups I've ever tasted. DELICIOUS!!! I do not like potatoe soup at all, but it is soooooo good! And even my 2 yr old and 5 yr old loved it! Thanks! Can this be made ahead of time and re-heated? Does it freeze well? Thanks. As I can't follow a recipe to save my life (intentionally so) I will be adding dungeness crab, Garlic, Red Peppers, Anaheim Chilies, basil, parsley, and maybe some fresh tumeric. I guess it'll be more of a chowder, but having never made a potato leek soup, your recipe seems to be a good base I can start from. Thanx. We do not mix meat and milk in our cooking so I made this recipe using water instead of chicken broth and it is just delicious....very creamy and tasty and a "winter night" favorite. I also used lactose free milk instead of cream for obvious reasons but the result is still great! Thank you so much for this recipe! I knew it was a success when my two picky eaters ate every bit in their bowls. I have made a BLT+P soup before (Bacon, Leek, Tomato, Potato), but I was looking for a meat free dish and this was perfect! Blessings to you! I chose your (or rather, your mom's) recipe last night due to the simplicity and straightforwardness of it.I added two chopped and browned strips of bacon to the recipe (as the first step) as my only change, and although great in concept, it would have been better as a garnish. Soup was a hit and I will definitely make it again though I may blend some of it as I like it a little smoother.I'm sure your mom is proud of you for sharing such a wonderful thing- thank you for making that decision so the rest of us get to enjoy it! This is the first time I made home made soup. It was delicious. Even my picky-eater son said it would be OK to make it again. Your photos provided enough visuals for even this cooking novice to see how each of the ingredients are prepared. Thank you for making this wonderful recipe available. Just made this scrumptous, hearty soup. Everyone LOVED it... even shared it with two neighbors, and they exclaimed "WOW!". Thank you for sharing your Mom's delightful recipe. Put *smiles* on all our faces! really nice...thank you for sharing...thought it was tasty w/o the cream...then I added and OMG....yummy! It will be a staple for me. Thanks again! I made this last week and everyone loved it including my sister who is very picky and my brother's friends who were all 13 years old. I modified it to be a bit healthier by using 2% milk instead of the cream and chicken boiullon instead of the broth. Was amazing thank you for sharing the recipe! I just want to say, Nicole, wonderful job putting this recipe together. Pictures, layout and presentation is flawless. You deserve a well done from me. Can't wait to make it tomorrow. Thanks! Thank you for sharing this wonderful recipe. My family liked it so much last weekend that I am making it again this weekend. I added fresh minced garlic to the leeks/onions, and corn kernels at the end. I had cooked bacon and cheese for anyone to put on top of their soup. MAN IT WAS DELISH!! !Your mama apparently had it going on. Thanks again! My sons are just coming out of that finicky period. I didn't know if they would eat leek soup but the whole pot was gone! It was easy and I love one-pot meals. Thank you! This was so delicious! So easy too. Thanks for sharing! This was really good. My daughter, age 2, enjoyed it and ate two small bowls!!! Made your soup today except instead of onion, I doubled the amount of leeks. I used half & half too, instead of cream. Otherwise, followed your recipe - used russet potatos, didn't peel them, mashed them into a kind of rough texture. It is delicious! I love your pictures, your commentary and your recipes. I just found your site yesterday as I was looking for a potato leek soup. Can't wait to try the chickpea, cumin, etc. soup. I just wanted to tell you that I made this recipe a few months ago when my twins were just turned 1 year old. My son loved it so much he actually cried when the bowl was gone and I left the table to get him more. He opened his mouth over and over again like a hungry little bird for this soup. The experience has led me to try leeks with other things and experiment with a food I'd previously never used. Thanks so much for a great recipe! I've been craving a nice Potato Leek soup all winter but haven't been able to find a good recipe until I came across your blog through a friend's recommendation. It was a cold freezing rain/sleety day here in NY, so I knew today was the day to make it. It came out deliciious and my whole family, including my 2 year old daughter loved it. The only things I changed was that I added celery (just because I had some that I needed to use up) and I used 4 russets and 4 small yukon golds. I also had some prosciutto in my fridge so I minced that up and added that in as well. And used half-and-half instead of heavy cream since that's what I had in the fridge. It turned out fantastic and can't wait to have some for lunch tomorrow. Thanks for the recipe!! I'll definitely be reading more of your blog in the future! i got online to find a potato leek soup for dinner--and pictures! you use lots of pictures! Super for someone like me who isn't a natural cook (even after 30 odd years, sadly! )i loved the story of you and your mom and your memories, thanks for sharing it all--what a sweet testament to the sort of woman your mom was.i needed to use up some vegies so i added grated carrot and sliced "baby bella" mushrooms to the sauteing part and it turned out well. The texture was great, the taste was awesome, and your directions a thing of beauty. :-) Thanks for the EASY recipe (this soup is one of the times you can use "cheap and easy" and have it be a good thing. I seldom cook because my grandma usually cooks for our whole family. But tonight she was out of town,so I told my family I'd be the cook. I used your potato leek soup recipe tonight -everybody thought it was delicious. Thanks for making me feel proud at the dinner table tonight! My wife grew up in the Scottish countryside, where hearty soups are an honored tradition. She absolutely loves this recipe, and even says it's as good as her Mum's Scottish potato leek soup (not better, just as good, but then she'd have to admit I do something better than her Mum...). My kids are picky eaters, but lap this soup up. I serve it with garlic bread on the side, and they're happy as clams. This was a lovely soup, and a beautiful story about your mom. As the mother of a daughter who is one of those people who is just authentically herself, I think a lot about how to help her keep that wonderful aspect of herself as she gets older and peer pressure kicks in. Just wanted to say thanks for okaying my inclination to not peel my potatoes. I've never eaten or made this soup before, but faced with both potatoes and leeks from my CSA box, I thought I'd give it a go. 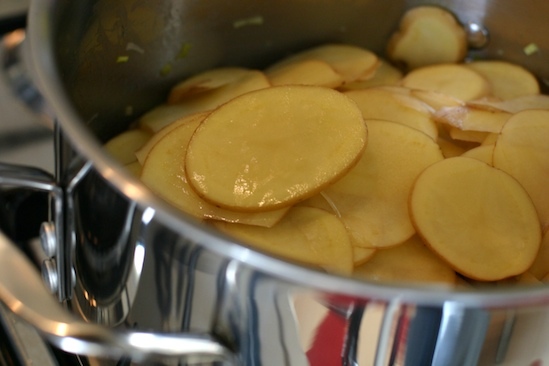 However, all the recipes I could find said to peel the potatoes, and I hate to do that since they pack such a nutritional punch.I'm glad I found your recipe so I can go ahead and do what I wanted, and know someone else has already tried it! April 4 2010 17:45 I am trying this recipe right now,smells great so far. 18:09 last 15 minutes until it's ready. 19:01 and the verdict is AMAZING, this is one of the many great soups that will become a comfort food,and will enjoy often...thank you. I absolutely love this soup. So does my family. I think that the butter and cream are essential - they add that oomph to the soup. Everyone is so "healthy" when they cook that they have completely forgotten that cream and butter IS healthy - in moderation. Also, the combination of these particular ingredients fills you up and keeps you satisfied for hours. You will not be reaching for bread after an hour. I always liquidise my leek and potato soup and peel my potatoes. I think that I really like the colour when liquidised! Next time I make this I will leave the skins on but still liquidise. Thanks for a fantastic blog. made this soup for my family last weekend. wow. it was amazing. i used red potatoes instead of the russets, and i added green onions, oregano, and grated fresh parmigiano on top. i also used a little more cream, butter, and i used vegetable stock to make it vegetarian. everything was completely eaten. no leftovers whatsoever. it was amazing. thanks a bunch for the recipe. This looks great, going to make it today, with some reuben sandwhiches, I already cut everything up and going to cook everything a little before dinner... For the potatoes, I just used a mandolin, works just as well, and easier. I've been looking for a good potato & leek soup recipe for so long. Thanks to you I've finally found it! Thank you so much for sharing! Even my 8 y/o who's a super picky eater loved it! Great post too. Blessings to you & your family. Thank you for this delicious recipe. I have made this soup 3 times now, and each time was just as good as the first. Living in western Pennsylvania, we have a great supply of wild leeks. I froze about 20 pounds from spring, and just used more of my surplus up tonight. Once again, thank you for sharing. This soup is DELICIOUS!! I did use the immersion blender - and it was PERFECT!! Did it just like you said... we're gonna add a little shredded cheese to the top of the bowls just before serving!! Yummy - and thanks so much for sharing! My husband told me 5 times not to lose this!! Thanks for sharing this recipe! We absolutely love it! Even my son liked it. He is 11 months and doesn't like veggies that much but this soup I can say, it was a favourite! Thanks again!! I tried this recipe and loved it. But, I don't like using cream that often (because of all the fat.) so I used milk and one can of cream of chicken soup. Also, I added corn, garlic, and chicken spinach sausage. Came out great! I am going to make this tonight, it looks and sounds so good! I have only cooked with Leeks once (earlier this week) and fell in love. My roommate has been requesting soup, so I'm making this one special for her before she starts working nights and will be missing out on dinners at home. Thank you for sharing your mom's recipe! Food brings up such powerful memories of family! Made this the other night, and it reminded me so much of one my gran made every winter with plump little homemade dumplings and potatoes, that I nearly cried. Next time I make this, I'm going to pop in some dumplings....Thank you so much for sharing this, it meant a lot! My mom made this my whole life, and on a rainy day like today I want to run to the store for groceries to make it now!! She adds about a cup of sour cream instead of heavy cream after she removes it from the heat, and adds Dill and 1/2 inch cubes of cheddar cheese...it is the BEST!This soup tastes even better after sitting in the fridge overnight and reheated the next day!YUM! Hi there,What a lovely recipe and story! Thank you for sharing.. Does anyone happen to know how many people this soup serves? I would like to make for a group of 10. I am pretty sure this recipe would serve about 4ish...but would like to make sure. Any insight would be much appreciated ;-)Cheers and enjoy! This is so easy and delicious! I had potato-leek soup in Eureka Springs (my favorite place in the world) once. This is so much better. Just got the ingredients to make it again!!! Just made this~ and used 1 cup of nonfat milk with 1 Tablespoon of flour instead of the heavy cream if anyone is interested in a lower cal/fat alternative...delicious...thanks for sharing your talent. Nicole, how blessed I was to find this recipe online! We have an annual Family & Friends' Thanksgiving Soup Supper potluck on Friday evening after Thanksgiving. It's a time for fun, food, fellowship & thanksgiving. It has become a tradition we all enjoy. I decided that I needed to make a new soup this year. My nieces, ages 4 & 9, helped me find your recipe online. We had a memorable time slicing up the leeks & going over the recipe. The 4-year-old was so cute standing on a chair with her larger-than-her apron on & I gave her the "job" of separating the sliced leeks! Obviously not necessary but it gave her something to do to be involved! The other niece was instructing us on what to do next. The soup was a hit at the vegetarian potluck! We probably had about 75 people there! When we got home, I read that this was your Mom's recipe. Very moving for me since the recipe I usually make for this event, corn chowder, is my Mom's recipe which I love. It sounds like your Mom is no longer with us & mine is sadly not a part of my life. We both have the loss of moms in common. But we also each have our Mom's soup recipes which we can share. That is a blessing. Thank you for sharing something dear to you & from your heart. It touched mine. Happy Thanksgiving! I added a parsnip as I was short on potatoes. Then I threw in some baby carrots. And OMG it was delish as the original!..love this recipe! Making this right now!! I read the recipe to be sure I didn't forget anything. I didn't. This soup is ingrained in my heart! I used Yukon Golds ( I like the color) and fried a small portion of bacon and crumbled it on top of the soup. This is a great recipe as presented and allows for a little personalization if you want make it your personal comfort food. Thanks for sharing this great recipe! I didn't use cream, but added some cayenne, hot chili flakes, sea salt and plenty of pepper, and used up some Yukon gold potatoes that I had in my fridge- poured in a whole container of Trader Joe's free range organic chicken broth, then let it cook down for about 20 min. Put everything through the blender and came out with a delicious soup! I might try adding some cream later to see how it does with / without, but even without this is mouthwatering and soul-warming! Thanks again. I must have missed it, but I don't see how many leeks (and what part of them) nor how finely to chop them. We'd love to make this soup. Thanks. I'm going to serve this after our local St Paddy's day parade this weekend. How many servings does this recipe make? And does it double easily? I've made this over and over with potatoes and onions from my organic garden. It is so-o-o-o-o-o-o good! I use half butter and half olive oil, and substitute organic milk powder for cream, but you really can't tell the difference. It's a real favorite at our house! We made, we loved. Like most everyone, my husband (the cook) tweaked it by adding celery, which he chopped and microwaved with the onion. After the soup was finished, the soup looked like only potatoes and leeks--the onion and celery had liquified. He also added a dash of garlic salt. Yummy. Rave reviews from family, friends and neighbors. I've always thought his split pea was the best, but this is a close second. Hi. My husband bought a "share" of a farm, which means we get fresh produce from the end of May thru November. Our first box arrived this week, and it contained 3 leeks. I'd never cooked with them before, and was pretty intimidated. I went onto Youtube and found a tutorial on how to clean them, then I luckily found you and your recipe.Your recipe is wondrous. I can't even believe how delicious it is, and it wasn't hard, just a lot of cutting and chopping. To be frugal, I had 2 leftover baked potatoes in the fridge, and I peeld them and cut them up, and threw them into the soup too, where I mashed them.Thanks so much. I've bookmarked your site, and can only hope you'll continue to share your wealth of recipes! And such a nice story to go with this recipe, your mom cooked from the heart. Thank you so much for sharing such a beautiful story and delicious recipe of your mom's. This is by far the best version, so simple and hearty and rustic and I make it all the time. Tried all different recipes, some super fancy and difficult w/ the blending and unnecessary ingredients. Yours is perfect and I hope some day my daughter will think of me the way you do of your mom. My coworker's ill husband asks for it on a regular basis and I feel so good knowing I make this for him, so thank you from all of us. Love the soup, I only make this a few times a year but I always will crave it. I always add some bacon... Or a lot! Its very tasty I sometimes double the recipie and make lots.Thanks for this awesome recipe! Love this soup! Fall is just beginning to arrive here in southwestern Ontario, and this was the first heart warming meal that my daughter asked for. Like you, I am sure that it will be a memory of hers someday. Like many others I add a little bacon for my son and husband and I put frozen corn in too! May seem different, but it's an excellent additon. Thanks for sharing an awesome recipe! Thank you for sharing this recipe! I made this last night for dinner - first time ever making/eating potato leek soup, and it was delicious!!! Thank you for your recipe. We very much enjoy it. I've made this so many times and it is always delicious. I have made it with russetts, yukon golds and when I didn't have those red potatoes, both peeled and unpeeled. It's always good no matter how I make it. Thank you for sharing such a lovely, detailed recipe. It's never too late to leave a comment. I am so glad you shared this recipe. It was easy to follow and the photos are great. Cooking this soup up right now as our winter rains are just starting and it's a beautiful Sunday morning. I am a fine cook but this recipe which everyone else seems to "LOVES" came out very starchy and bland......not worth the work in my opinion.Sorry to be the only unhappy persons.. Marvelous pictures ... I was just scrolling casually through them (while cooking the leeks and spuds, and a bit of ham, in the background), the Cuisinart, very nice ... Swanson chicken broth, sure ... and then I had this sudden shock moment of recognition at the cream step. U. S. Armed Forces heavy cream, fresh from the commissary, just like what I grew up with. (Card-carrying overseas brat, here. )Thanks for the great description, and the pictures. Cheers! Have made this soup a number of times and it is absolutely delicious - and SO easy. To the person who said it came out starchy and bland, what kind of potatoes and broth did you use? I think it came out great. I like it thick and did not mash potatoes too small. Everyone loved it. This came out beautifully! Thank you so much! I ended up using 3 different types of potatoes (white, russett, & butter) to get a wider range of flavor. Also, using 8 potatoes, I ended up using about 1 1/2 cups of cream. Everyone loved it!! Thank you again! Hi Nicole,Thank you so much for sharing this recipe. Cooking doesn't come naturally to me, but I managed to make this soup for my mom/brothers and it came out perfectly! I'm going to visit my aunt/grandparents for Christmas and I'm very excited to make this for them. :) I hope you have a wonderful holiday. Cheers! Someone necessarily help to make critically posts I'd state. This is the first time I frequented your web page and thus far? I amazed with the analysis you made to make this actual post extraordinary. Wonderful job! Great Recipe. I tweaked it a bit to make it a little more healthy without robbing it of the great taste. Instead of heavy cream I used Greek yogurt mixed with milk. If you are using one cup you measure out half a cup of Greek yogurt and mix it with milk (I used 2%). Beat until smooth then add to soup. I also used a low sodium organic stock and organic potatoes. But that is personal preference. What would be an approximate weight guess for the potatoes? I put a bay leaf and three slices of bacon in with the leeks and kept them in with the potatoes while they cooked. Took them out before I mashed them. Then put it all in the food processor, rinsed out the pot and put it all back in. Added two cups of heavy cream (I think milk would have been fine), and topped with chopped leeks and browned almonds.As good as anything I've had in a french restaurant. Thank you! OMG! This soup is super yummy. I searched online for a potato-leek soup and your recipe was one that came up. It had less ingredients than most and seemed to be easier plus I had most of the ingredients on hand. The only thing missing was heavy cream. 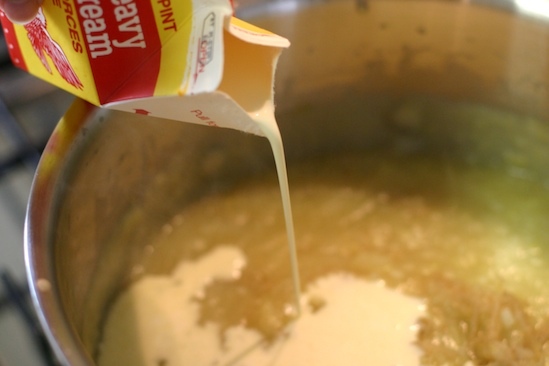 I substituted evaporated milk and then when it came to a boil I added some cornstarch that I dissolved in cold water. My family thought I was nuts and weren't sure they wanted to try this because it smelled so strong when cooking. They fell in love with it and wanted to know when I would make it again. That's definitely a big thumbs up. Thank you so much for sharing this. It is going in my recipe box for sure. Thank you for sharing such a special food memory! I just found this, nearly 4 years after you first published it, and it was exactly what I was looking for today. I'm sure your mom would be thrilled that so many people have enjoyed her recipe. I have a basic but delicious recipe for breakfast potatoes that always makes me think of being a little girl and Saturday morning breakfasts when I cook it. (That's why I first learned to slice potatoes!) Food is so close to the heart. I made this recipe last night and it was DELICIOUS!!!! Wow. I had fresh leeks and potatoes from T&D Willey Farms and didn't know what to do with them. I'm so glad I found this recipe, and what makes me MORE excited is that you're in Fresno too!!! What a small world, thank you for this fun blog! I am also a returner to the area, I was raised here, then lived in northern and southern Ca, and now am back. Blessings! I just wanted to say how amazing this recipe is. I have been trying different potato leek soup recipes for years and have always found something I didn't like about them. Either they were too complicated, used unsalted butter (which I don't believe in) and always pureed. I wanted a potato leek soup that was chunky, flavorful and easy; this recipe gave me exactly that. I used two cups of cream instead of one and it tastes heavenly. I took the time to review over all your other recipes and you can be sure I will be trying as many of them as I can. Thank you for posting such delicious recipes! I look forward to having this soup this weekend (on Sunday). I love that the directions are pretty much on top, so I can get right to it as opposed to having to scroll down a mile on the page and find it. I also LOVE that I do not have to put this in the processor after it's done cooking. This was the first soup I ever tried to make...it was a HUGE success!! Thanks! Thank you for sharing this recipe! My grandpa use to make the best potato soup, unfortunately he never wrote down his recipes and now that he has passed I really miss his soup. Hopefully this is close to his! So easy.... really simple recipe.... VERY yummy..... PERFECT soup for a fall evening with crusty bread and salad! LOVE IT!! Thank you! Made this soup for lunch today with leeks and potatoes from our last CSA box of the season. I used half & half instead of cream and it was delicious! Thank you for the easy recipe, I will definitely use it again and again! Needs bacon - render it down, pour off all but a couple of teaspoons fat, follow the recipe - mmmmmm - everything goes better with bacon (and beer). I have made this soup twice now and each time I love it more. Very easy, very satisfying and very delicious. I added about 1/3 c of cream at the end, and that was sufficient for me. I also used an immersion blender to smooth it and it was just right with an occasional chunk of potato for interest. Nice recipe glad I stumbled on it. I am very creative in the kitchen, have a food blog, and make great soup but never tried potato leek. I saw some beautiful looking leeks in the supermarket and couldn't resist buying. I started looking for ideas and stumbled upon your recipe.It was perfect! Simple, homey-just what the doctor ordered on a rainy, cool fall day. I added a little more seasoning (we like a little spice and heat) and it was delicious!Thank you for sharing. It was probably a great step forward for you in the healing process too. I came across this recipe a couple of years ago. My family LOVES this - even my husband who hates anything onion related. I just made it last night for the first this season, my kids were looking forward to it all week! Thanks for sharing! I love this soup. Every time I make it, I plan on taking some to my neighbors, so they can taste the great flavor, but instead just end up eating it all with my hubs. I did change it a little, I use 1 & 3/4 packages of cream cheese instead of whole cream and added sauteed mushrooms. I also use most of the dark green part of the leek. SOOOOOO good!!!! I will be trying the soup, it looks so good. Lots of good information here. This was lovely. I just made it to the recipe (1/2 cup cream) and really am very happy I found it! I think the slicing of the potatoes vs. chunks/chopped really made a difference. I will be enjoying this for many days to come. Thank you very much for sharing a personal favorite with us, that has now become a favorite of mine. "Killer." This from my husband, pickiest of all eaters. Thank you for a terrific recipe. I've doubled the recipe to take to a Soup and Sacrifice meal tonight at my parish. Smells great. BTW if you have a Trader Joe's in your community they sell lovely sliced leeks in their freezer for 1.49. No washing necessary! Threw a couple of bags into the saucepan. Smelling great! Thanks for posting. Thanks for the TJ's tip! I didn't know about the frozen sliced leeks! This soup is delicious and I've made it countless times! But is there a printable version? ?